Select-A-Shield™ Select-A-Shield™ forensic portable tent enclosures protect data chain of evidence by blocking electronic devices from accessing active wireless networks. Easy to assemble, these mobile enclosures are the right choice for isolating multiple wireless communication devices including cell phones, smartphones, PDAs, tablets, GPS units, and laptop computers. SELECT offers three standard portable RF shielded enclosures for use in digital forensics device containment & secure extraction. Popup frame, double (US No. 8,530,756) or single (US No. 9,029,714) patented door isolation systems, tent carry bag, a conductive floor between two layers of heavy duty vinyl and a cable sleeve all come with an enclosure. For special applications, Select Fabricators also makes custom sized enclosures. Options include interior lighting, I/O filter plate, ventilation, and vestibule. Select’s high attenuation portable enclosures can be configured to have -85.7 dB minimum shielding effectiveness in the 400 MHz to 18 GHz range. Shielding performance data must be carefully scrutinized to assure the enclosure as used will meet requirements for a specific application. 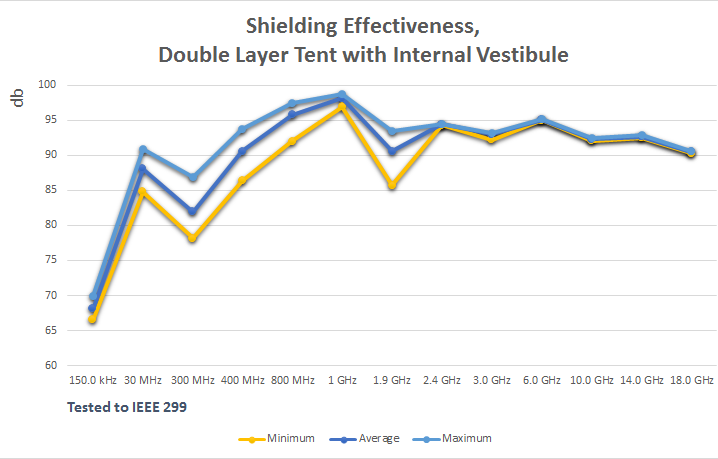 Select Fabricators uses the IEEE® 299 standard test, conducted by an independent test lab on a completely assembled system, including installed components, operating under typical conditions at various frequencies measured through the tent wall at multiple locations. 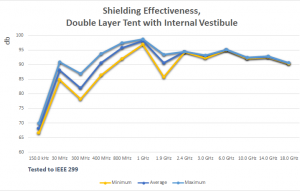 The minimum readings indicate shielding functionality that can be expected.